Seminar paper from the year 2009 in the subject American Studies - Miscellaneous, grade: 1,0, TU Dortmund (Anglistik & Amerikanistik ), course: The Image of America in German Language Literature, language: English, abstract: The reason why I decided to focus on this topic is simple: There are innumerous images and concepts of America1, written down by an equally uncountable number of writers from all around the world, also including citizens of the United States themselves. Moreover, I tend to believe that there is no other country in the world, which had inspired more authors to deal with it in their literature. This might be a result of the well-known picture of America as the land of unlimited opportunities, which spread around people's minds ever since the 'New World' had been discovered in 1492. As many people still regard America as the 'promised land', there surely developed Images of this country, which might not always be true, or at least not as positive as some dreamers might think. 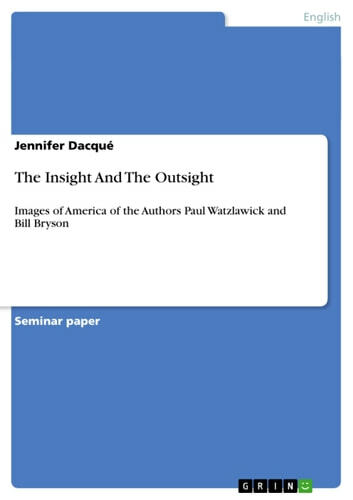 Therefore, I decided to base my essay on the books of two quite critical authors, Paul Watzlawick and Bill Bryson, who present America in a questioning way and do not simply glorify its social, economical and political structures. Nonetheless, both authors succeed in drawing a rather sympathetic Image of America. This literary contrast encouraged me to compare both: authors and novels, but most importantly, the development of their Images of America. How does the general orientation offered by Maslow's theory of self-actualization fit into the HRM culture?